If you would have told me 4 years ago when I was living in Park City, Utah, that I’d be creating HDR images, living in Scottsdale, Arizona, and loving my DSLR, I would have told you that you were crazy. For over 15 years, I was a bona fide film junkie of the Fuji kind and, when the world started going digital, I dug my heels in and fought it to the point where I eventually hung up my camera for good—or so I thought. 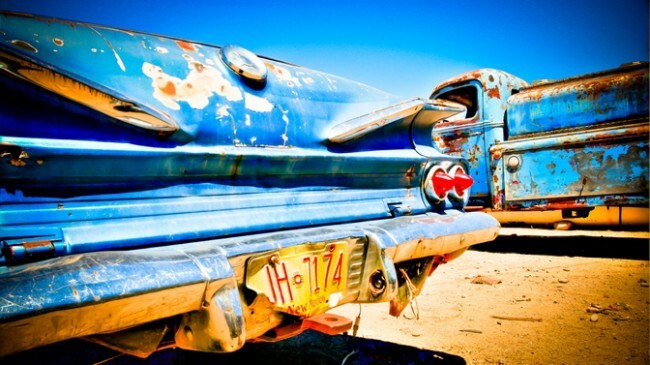 It all started with a beautiful old red truck that I photographed years ago on a road trip to S. Utah. Although I had all but given up photography as things went digital, I was out getting to know my new DSLR, that I reluctantly purchased, when I saw this beauty on the side of the road. I actually passed it by on my way to shoot something else, but the truck stuck in my mind so I doubled back and shot some photos. I had really never been attracted to shooting old trucks, or any old vehicles, for that matter. As a professional since ‘89, I had mostly focused my attention and my lens on my stock photography specialties, which were adventure sports, outdoor recreation and health & fitness until I hung my camera up in 2003. A few weeks before I took those photos of the red truck, a friend and photo enthusiast asked me if I had ever heard of HDR. My response to him was, “HD what?” I think he was surprised that I hadn’t heard of it. I didn’t realize that I was that out of the photo loop, but after being out of the business for several years, I guess I was. He said I’d have so much fun with what high dynamic range could do to my photos. He gave me the name of the program that he used, Photomatix, and the website. When I got home, I immediately jumped online and checked it out. I downloaded a free trial of Photomatix Pro, and off I went into HDR land. Of course, I hadn’t shot any photos as multiple exposures, which was suggested, so I really didn’t have any photos to play with yet. Then I passed the old, red truck on the side of the road. Instead of shooting single frames, I photographed the red truck in the prescribed multiple-exposure manner. I thought that it might make a great HDR, so I rushed back to my campsite, downloaded the images from my camera into my laptop, then quickly loaded the three bracketed images into Photomatix and pressed the “Generate HDR” button. That’s when the magic happened; I could hardly wait to see the result. When the image appeared on my monitor, I gasped. It was gorgeous and so alive with color, texture and depth. With a few tone-mapping tweaks, which I didn’t really know how to work yet, I hit the final “process” button, and what appeared was nothing short of incredible—it was as if the truck was about to drive right out of the monitor and into my campsite. I thought the truck was full of character and personality when I shot it, which is why it attracted me in the first place, but the individual digital frames that I shot didn’t do justice to this gem that nature had aged like a fine wine. 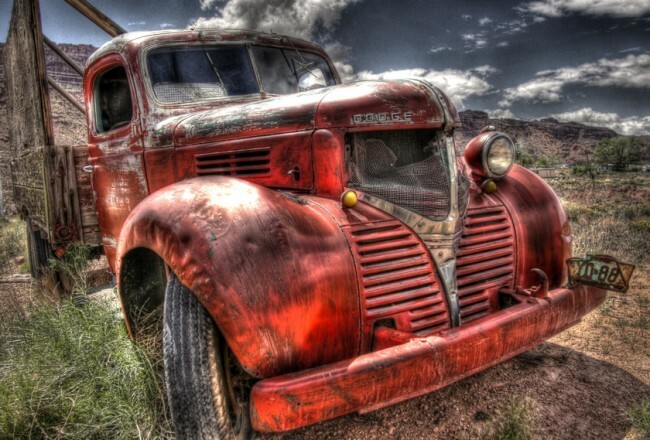 They seemed too one-dimensional and lacked a feel for the texture and patina of this amazing red truck. With HDR, I knew that I had found a process and program that was not only user-friendly, but would transform these relics and render them the way that I saw each one when I was photographing them. I’ve been fascinated with Western and Southwestern history for years and with my newfound love of the Digital Age, I could make the historic places and things that I’m fascinated by come to life again. 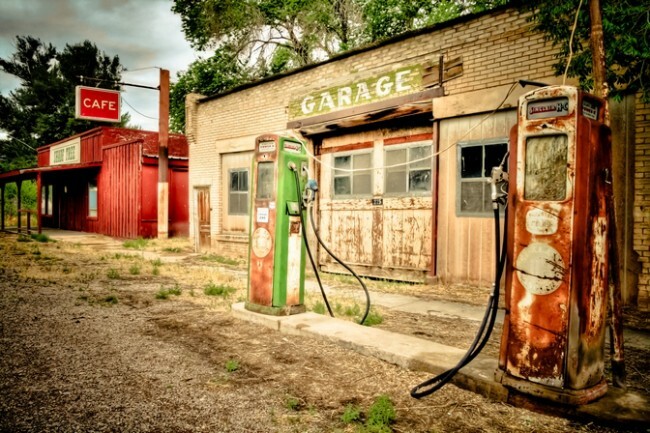 The red truck, aka “Dodge Bootlegger,” changed everything for me. I knew that I was on to something when I posted the “Dodge Bootlegger” on my Facebook page. The response was amazing! I don’t think any of my photographs has ever received so many great comments. This opened up a whole new world for me. Not only did it give me a reason to pick up my camera again, but it gave me a reason to follow a new path back into a creative world that I thought I was done with. It was a path that I was very excited about. Since then, I’ve been on a mission to photograph historic places and objects around the West and Southwest. My journey has taken me from Golden Spike National Historic Site in northern Utah to the Pony Express Trail to Route 66 on down to Tombstone in southern Arizona, with many stops in between. Out of this journey my Ghosts of the West: Celebrate the American West—the History, the Lore, the Culture photo series and book were born. So many of these historic places and things are disappearing, and I feel it’s my mission to document them and make them come alive again with my photographs before they’re gone and to document what’s so uniquely American about this part of the country. I love what I do and feel so fortunate to get to share my passion for the West and Southwest through my photographs, and I have HDR to thank for opening up a whole new world (again) to me.